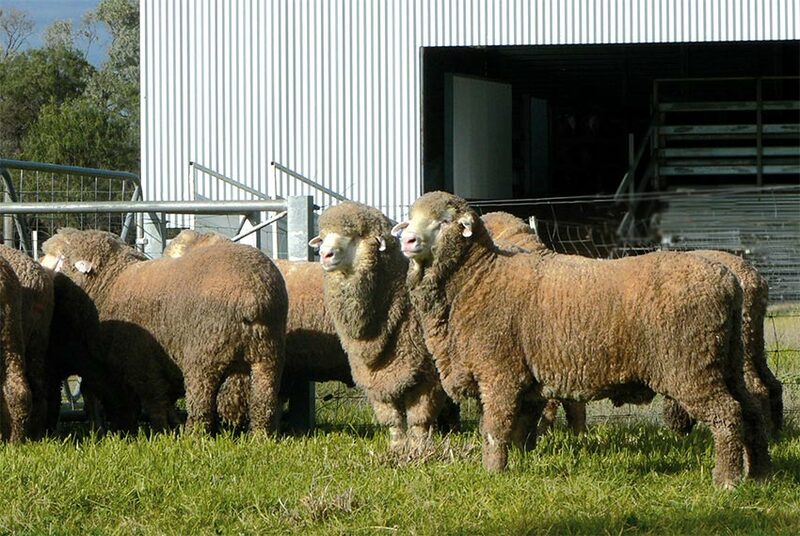 One Oak Poll Merino Stud was established in 1963 by Alby and Graham Wells, and is now a run by Alistair and Natasha Wells. The property is situated 45kms North of Jerilderie, in the heart of the Riverina. The Stud has 2000 Stud breeding ewes which are run on Riverina plains and Boree country. In conjunction with running the Merino Stud we also sow 500 acres of cereals, with some irrigation. Our main enterprise, however is as a sheep operation. One Oak Poll sheep are run on a combination of 80% native pasture and 20% farming country. We consistently select the toughest, most robust sheep, which will survive and thrive as an easy care animal. One Oak Poll’s current five year average micron is 20.0 with a focus on large framed, free growing, heavy cutting sheep. Our adult wool clip ranges from 19 to 22.5 micron. As a stud breeder, Alistair gained varied experience by working in the family business of One Oak, in New Zealand’s high country, the sheep/wheat belt of Western Australia and for Wool Lot Builders in Melbourne. Whilst working in Melbourne Alistair also attended the Melbourne College Of Textiles. eece weight, body weight and visual assessment for his breeding program. We have used sire evaluation to benchmark our sires as well as attending national shows. With the demand to become finer in early 2000, we stopped showing and focused on looking after our commercial clients. The majority of which wanted to keep cutting a volume of good wool, put their wether lambs over the hooks and join older ewes for the prime lamb market. We then used the next ten years to soften our wool and develop our type of sheep. During the drought period we focused on improving constitution and the fattening ability of our sheep. In the last few years we have returned to showing a small number of sheep. This year we increased the number of our show team to take to Hay, Bendigo, and Dubbo shows. We will also display a team of sheep at Bendigo, Deniliquin, Dubbo and Southwest Slopes field days. We hold an annual on property auction each year in September and also sell privately.